Principled Technologies (PT) tested two blade server platforms to see which could allow admins to carry out several routine management tasks more efficiently. Durham, NC, March 15, 2019 --(PR.com)-- All IT server administrators must devote a certain amount of time to routine management tasks such as deploying server nodes and updating firmware. However, a new study from Principled Technologies demonstrates that the time and number of steps such tasks require can vary considerably from one platform to another. When admins can dispatch with routine tasks more quickly, they have more time to innovate and deliver value to the company. 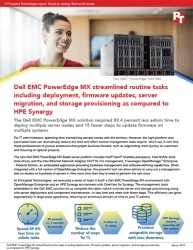 To learn how the Dell EMC PowerEdge MX can help companies achieve these benefits, review the comparison report http://facts.pt/jyiqavn, summary http://facts.pt/lce11om, and infographic http://facts.pt/9smxbd7.